Mizuno Toshikata (1866 - 1908) Kusunoki Masatsura and his Mother Escaping the Field of Battle, c.1892. Oban triptych. Toshikata is one of the outstanding artists of the Meiji period. In terms of his ability to draw the maximum amount of subtlety and delicacy from the woodblock medium he is every bit equal to and in some cases (like this print) superior to his mentor Yoshitoshi. This print is a graphical masterpiece, understated and yet brimming with knowing and great visual understanding. 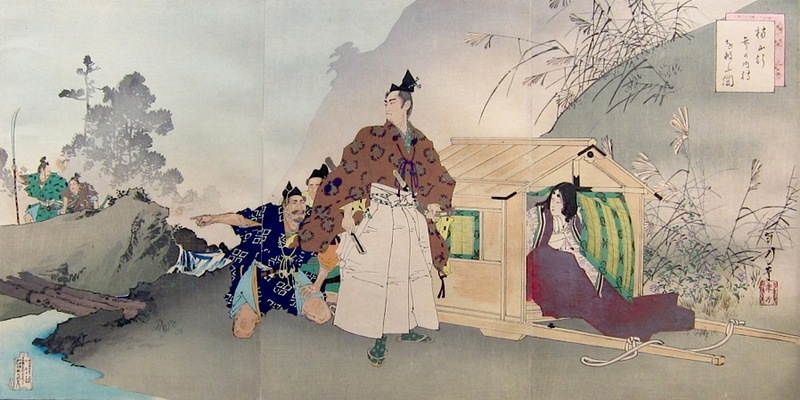 We see here the fourteenth century samurai Kusunoki Masatsura fleeing his pursuers with his mother in a palanquin. 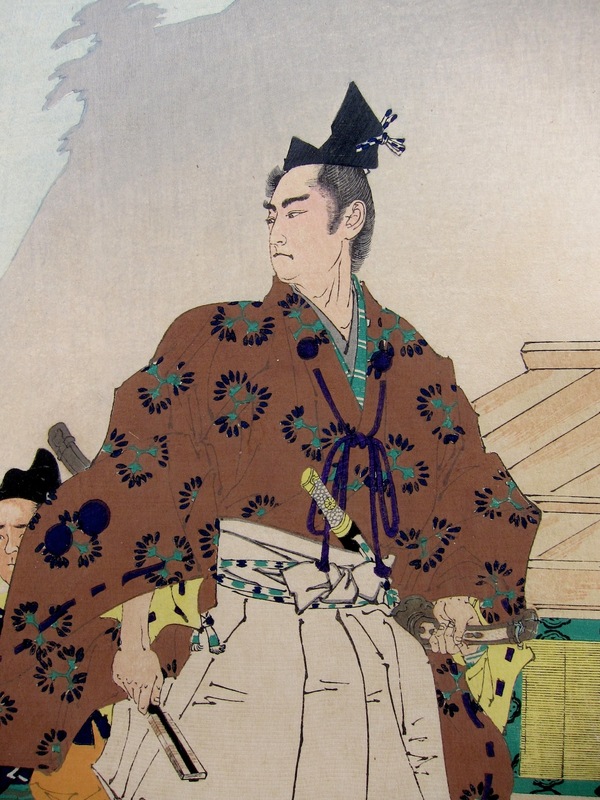 His father, Kusunoki Masashige is celebrated in the epic chronicle, The Taiheiki, as the outstanding example of the samurai, especially his loyalty to the Emperor by his example of self sacrifice. The instructive aspect of Kusunoki Masashige came to be emphasized, and this was the primary reason for dissemination of his legend. His name was revived in the Meiji to instill devotion to the new regime and his cult continued to inspire soldiers even in the second world war. Less known is the important revival of his wife, who in the late nineteenth century was revered under the Meiji administration as the primary example of a good wife and wise mother. It is her action after the defeat of Masashige, in which she teaches her son the dying injunctions of his father, persuading him not to commit seppuku but to retreat and fight again which made her famous in the lesson books of the early Edo period addressed to women. I have a feeling / I will not be returning / so among the names / of those who died by the bow / I inscribe my own. This beautiful triptych is in perfect condition and shows the extraordinary beauty and subtlety of Meiji woodblock printing. The colour and the impression are very fine. Centre and right sheet attached with Japanese album backing paper.